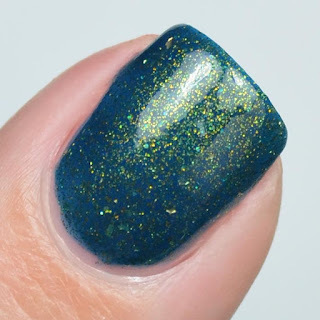 Do you guys have a polish color that you buy frequently without realizing it? For me, it's probably anything in the aqua/blue/teal family. For those of you who love that color range, I think you will be delighted with today's post. If you aren't subscribed to the Baroness X Monthly Mythical Mysteries you likely missed out on Donglin Forest. Notes: I really adore this color family. I'm not usually big on gold anything, but paired with this base the shimmer is just perfect! Baroness X Donglin Forest is no longer available for sale but it might be making a comeback briefly (hint hint wink wink). You might want to join her fan group (nudge) linked below for more info. If you enjoyed this post you might like 31dc2017 - Multichrome Triangles feat. Baroness X Niseag and Baroness X October 2017 Monthly Mythical Mystery + Sugar Whipped Soap.